Born out of the same award-winning technology as Vivint's Doorbell CameraTM, the Vivint Ping Camera helps you connect with loved ones at home when you're away. Featuring a 2-way video intercom, you can monitor pets, check to see if your kids arrived home safely from school, or your child can “ping” you on your smartphone Vivint Sky™ App for a quick chat. The Vivint Ping comes packed with features, providing you with a motion-activated camera, remote intercom, and the ability to record relevant video clips—all in one counter-top device. Simply press a button on the Ping camera to reach any smartphone or tablet connected to your Viviny Sky™ App account. Get custom notifications sent to your mobile device and personalize your alerts for specific events, such as when a person enters the room. Infrared technology means you won't miss crucial moments—even when the lights go out. Save 20-second video clips and get them on-demand for up to 45 days. Advanced video analytics ensure that you keep only the footage that matters. You'll get crisp 1080p HD surveillance video and a 140-degree angle of view, giving you the clearest picture possible. 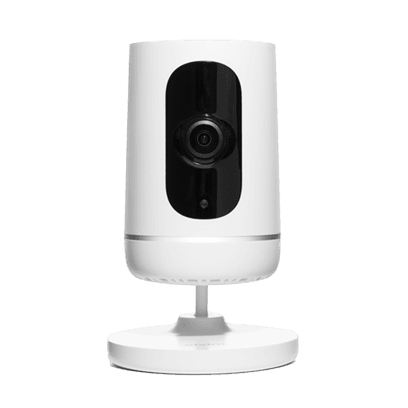 The Vivint Ping Indoor Camera works with your Vivint Sky™ app and can be added to your Vivint Smart Home security system. Browse through video clips any time you like from your mobile device (with Vivint Playback).